"While negotiating peace between two brothers contesting the throne of Thebes, an amnesiac Hercules is seduced by the evil Queen Omphale." Directed by Pietro Francisci. Written by Pietro Francisci, Ennio De Concini, and --get this-- Sophocles and Aeschylus. Starring Steve Reeves, Sylva Koscina and Sylvia Lopez. I have the worst time following these. Same with The Giant of Marathon, when The Film Crew did it. I'll be at Rifftrax Live tonight, so I will probably miss this one. We had this episode on tape growing up and I watched it all the time. 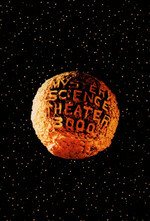 In college, I took a "myth in film" class, and we watched this movie (sans MST3K commentary). I had a reeeeeally hard time keeping it together. We'll miss your wit, witt. So..... Oswalt Patton huh? I think he woulda made a better host. There's a whole lot of meta-drama over whether there is actually drama within the original creative team. I'm not sure if I want to get into here. I can say that Josh had the single best thing I've read yet about a new cast. I swear I start giggling inside whenever I see a woman playing the harp, because I'm sure she's going to sing that at some point. Sylva Koscina is transcendently beautiful in this movie.